We develop open source tools for biology research. We also write project-specific data analysis code. To see what we’re working on, visit our publicly-accessible repositories on BitBucket.org. IGB is visualization software for genomics. Originally developed for fast visual exploration and analysis of Affymetrix tiling array data, we updated IGB to handle visualization of RNA-Seq, ChIP-Seq and other *seq data sets. IGB is free, open source software. Genes that participate in the same process or pathway often require coordinate expression. As a result, their expression co-varies across many experiments. Using co-expression analysis, scientists can identify new genes for pathways or processes where some of the players area already know. We developed an algorithm called pathway-level co-expression that searches local co-expression networks for new members based on their connections to two or more user-supplied bait genes. We implemented the algorithm in CressExpress.org, a Web site co-expression analysis tool for Arabidopsis. From the start, we realized that including every array in every analysis could introduce noise, as many genes are only expressed in a subset of cell and organ types. To improve precision of results, CressExpress allows users to select subsets of arrays to use in co-expression analysis. In 2015 we released a new version CressExpress that includes data from more than 8,000 Affymetrix expression microarrays. To facilitate array selection, we added fast keyword searching to CressExpress and improved the search interface for users. Users can now save their array lists to local files and upload them later when performing a new analysis. which records array identifiers recognized by other systems. 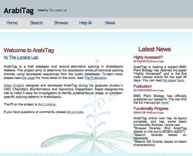 ArabiTag is a Web site that reports EST support for alternative splicing events, using Arabidopsis gene model annotations as a reference. We published this site alongside a paper that assessed prevalence of alternative splicing in Arabidopsis. ArabiTag was developed by Adam English, now at Baylor University, who also wrote PBJelly.